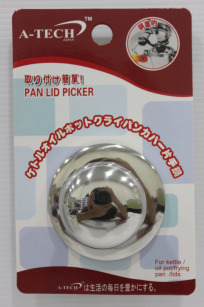 PAN LID PICKER (60mm) is made of quality stainless steel material, it is the replacement for faulty lid pickers for kettles, oil pot, frying pans and lids. Available in different designs and sizes to suit consumer`s requirement. 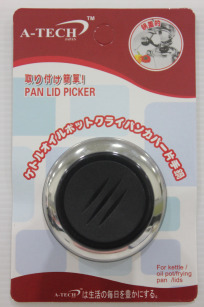 PAN LID PICKER (70mm) is made of quality stainless steel material, it is the replacement for faulty lid pickers for kettles, oil pot, frying pans and lids. Available in different designs and sizes to suit consumer`s requirement. 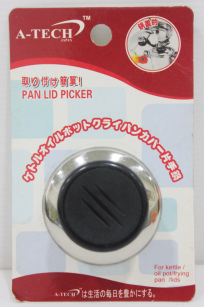 PAN LID PICKER is made of quality stainless steel material, it is the replacement for faulty lid pickers for kettles, oil pot, frying pans and lids. Available in different designs and sizes to suit consumer`s requirement. 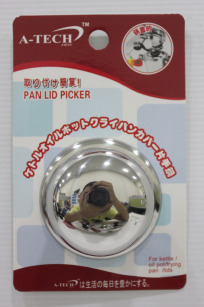 PAN LID PICKER (63mm) is made of quality stainless steel material, it is the replacement for faulty lid pickers for kettles, oil pot, frying pans and lids. Available in different designs and sizes to suit consumer`s requirement. 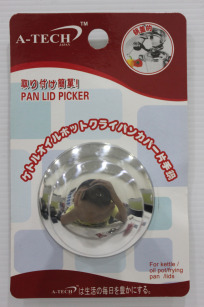 PAN LID PICKER (56mm) is made of quality stainless steel material, it is the replacement for faulty lid pickers for kettles, oil pot, frying pans and lids. Available in different designs and sizes to suit consumer`s requirement. 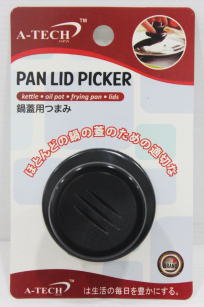 PAN LID PICKER (70mm) is made of quality Heat Resistant ABS Plastic, it is the replacement for faulty lid pickers for kettles, oil pot, frying pans and lids. Available in different designs and sizes to suit consumer`s requirement. 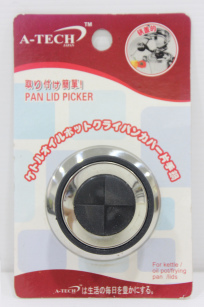 PAN LID PICKER (56mm) is made of quality stainless steel material coated with Black Coating, it is the replacement for faulty lid pickers for kettles, oil pot, frying pans and lids. Available in different designs and sizes to suit consumer`s requirement. 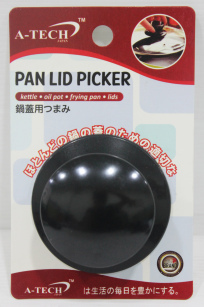 PAN LID PICKER (65mm) is made of quality stainless steel material coated with Black Coating, it is the replacement for faulty lid pickers for kettles, oil pot, frying pans and lids. Available in different designs and sizes to suit consumer`s requirement. 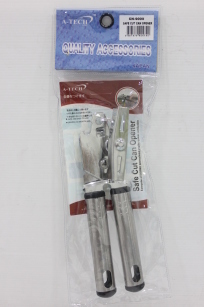 3 IN 1 CAN OPENER is made of quality stainless steel, it is a multi-functional can opener that can open cans, bottle caps, Sealed Lids easily without effort. Easy to use and clean by simply rinsing with clean water. 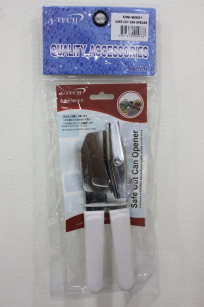 SAFE CUT CAN OPENER is a ergonomic tool that easily cuts open cans while leaving the lid smooth without rough edges making it safe from accidental cuts. 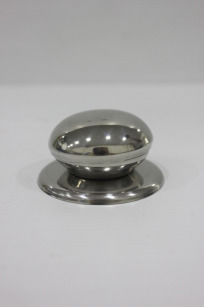 It has a rounded edged handles that provide comfort and ease for the user when using it. 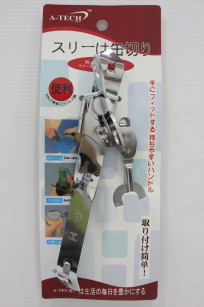 SAFE CUT CAN OPENER is a ergonomic tool that easily cuts open cans while leaving the lid smooth without rough edges making it safe from accidental cuts. 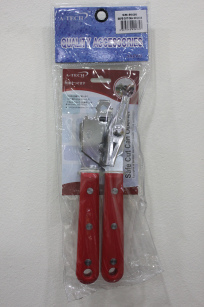 It has a soft angled edged handles that provide grip & comfort for the user when using it. 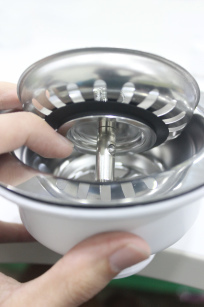 SLICER + GRATER is handy kitchen tool to swiftly & effectively slice and grate fruits Vegetables and many more. It is easy to use and clean by rinsing with clean water after use. 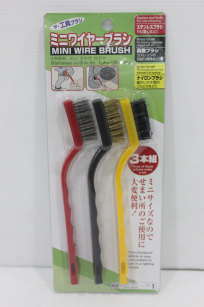 MINI WIRE BRUSH SET is a complete set of cleaning brushes that is meant for wide variety of uses. Stainless steel bristles are often use to remove rust, brass bristles are used for cleaning gas range & nylon bristles are meant for removing dust & dirt trapped in corners & openings. 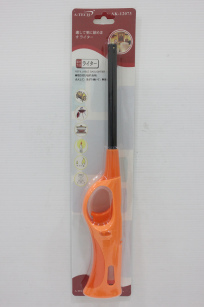 REFILLABLE GAS LIGHTER (WINDPROOF) is the wind-proof series of A-TECH Gas Lighters, it is compact & easy to store & keep. 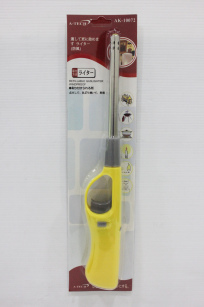 ideal for lighting candles, kitchen stoves, barbecue and more! It has a safety lock feature that prevents accidental triggers and also adjustable flame strength. It is able to generate strong flames that are wind-proof. 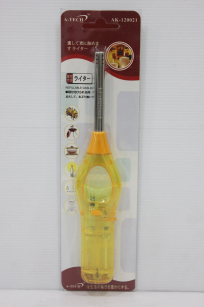 REFILLABLE GAS LIGHTER is the most affordable series of A-TECH Gas Lighters, it is compact & easy to store & keep. 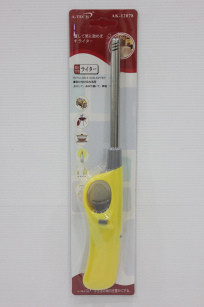 ideal for lighting candles, kitchen stoves, barbecue and more! It has a safety lock feature that prevents accidental triggers and also adjustable flame strength. 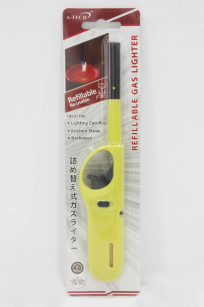 REFILLABLE GAS LIGHTER is the most affordable series of A-TECH Gas Lighters, it is compact & easy to store & keep. 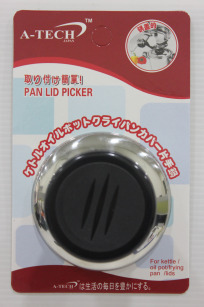 ideal for lighting candles, kitchen stoves, barbecue and more! It has a safety lock feature that prevents accidental triggers and also adjustable flame strength. It has clear translucent body to easily gauge the fuel levels. REFILLABLE GAS LIGHTER (FLEXI-TIP END) is the flexible nozzle series of A-TECH Gas Lighters, it is compact & easy to store & keep. 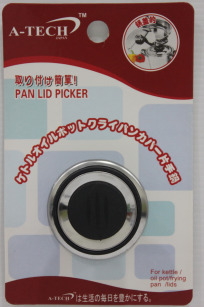 ideal for lighting candles, kitchen stoves, barbecue and more! It has a safety lock feature that prevents accidental triggers and also adjustable flame strength. 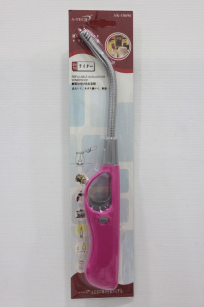 It comes with a flexible Nozzle that can be bended & adjusted. *Available in a 5 piece pack variant. 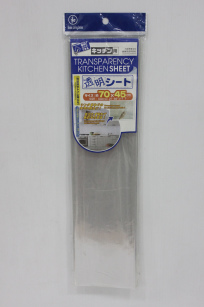 TRANSPARENT KITCHEN SET is a protective film that protects the wall near the stove or sinks and prevent them from getting water marks or grease & grimes. Its transparent colour makes it invisible and user`s can still maintain their kitchen design while effectively protecting their walls. 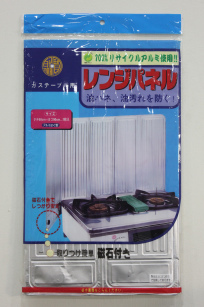 GAS RANGE SHEET (78cm X 50cm) is placed in kitchen under cabinets, stoves, cookers. It protects the surface from kitchen grease & grimes. *Available in a 2 piece pack variant. ALUMINIUM SHEET (2PC) – 51 x 88CM is made of top quality aluminium, it is commonly placed below or behind the cooker hood stoves to protect the surfaces from dirt, oil, grease stains. 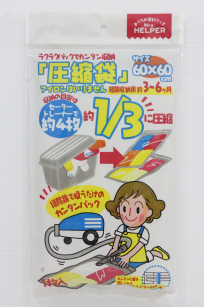 The Sheet can be easily cleaned by wiping with a cloth. 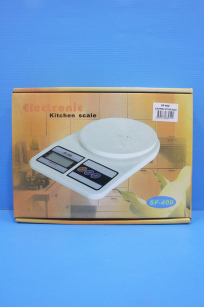 3-FOLD ALUMINIUM BOARD – 50 x 90CM is made of top quality aluminium, it is commonly placed below or behind the cooker hood stoves to protect the surfaces from dirt, oil, grease stains. The Sheet can be easily cleaned by wiping with a cloth and can be folded to curve around the sides of the stove. 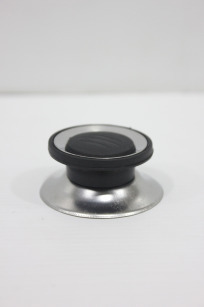 It also come with built-on magnets to secure the board onto the cooker stoves without the need for adhesives or tools. 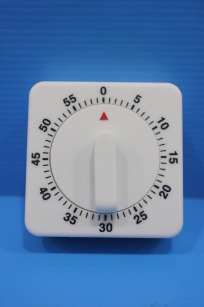 KITCHEN TIMER (SQUARE) is simple & easy to use kitchen timer, commonly used to measure baking time & cooking duration. 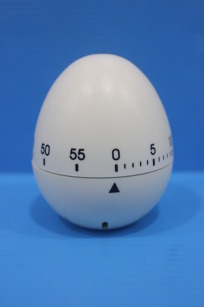 Just turn the body completely to activate the spring and then turn to set a time & the timer will start counting down,once it reaches zero the timer will ring. Batteries are not required for the product to work. 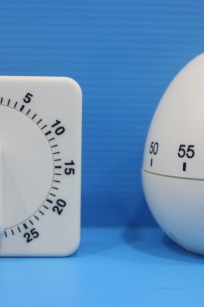 KITCHEN TIMER (EGG-SHAPE) is simple & easy to use kitchen timer, commonly used to measure baking time & cooking duration. Just turn the body completely to activate the spring and then turn to set a time & the timer will start counting down,once it reaches zero the timer will ring. Batteries are not required for the product to work. 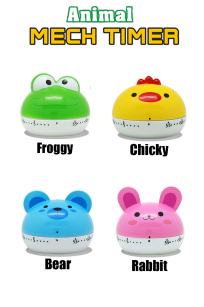 ANIMAL KITCHEN TIMER is designed for cute yet practical use, it is a simple & easy to use kitchen timer, commonly used to measure baking time & cooking duration. Just turn the body completely to activate the spring and then turn to set a time & the timer will start counting down,once it reaches zero the timer will ring. Batteries are not required for the product to work. 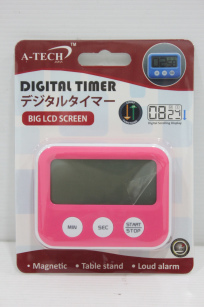 DIGITAL TIMER (BIG LCD SCREEN) is the the latest type of Digital timer, it has a wide LCD Screen with Large Number Digital scrolling display.The Timer comes with built in magnets on the back for user`s to stick the timer onto refrigerator or metallic surfaces. 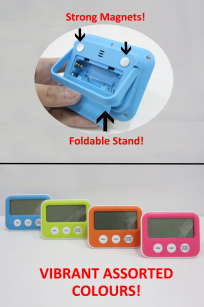 It also comes with a foldable stand that allows the timer to be place on tables on standing position. 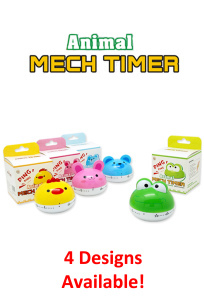 The timer not only counts down, but also has count up timer (Stop watch function) with extreme accuracy as compared to traditional timers. 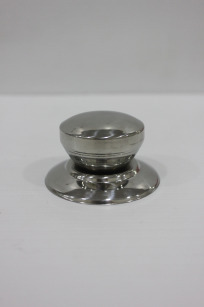 BASIN WASTE – 1-1/4” is commonly fitted onto bathroom sinks, it is made of Plastic Waste base with Stainless Steel Plate, the product comes as a set complete with a plastic chain hook and galvanised screws for securing the basin waste. Available in two different sizes to suit consumer`s needs. 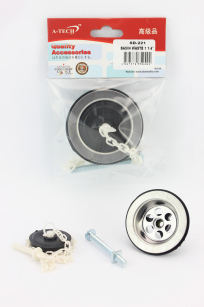 BASIN WASTE – 1-1/2” is commonly fitted onto kitchen sinks, it is made of Plastic Waste base with Stainless Steel Plate, the product comes as a set complete with a plastic chain hook and galvanised screws for securing the basin waste. Available in two different sizes to suit consumer`s needs. 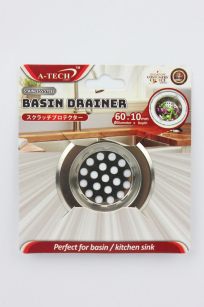 BASIN STEEL DRAINER (60mm) is made of quality Stainless Steel, it has a unique sloped edges to allow water to be effectively channeled into the drain. 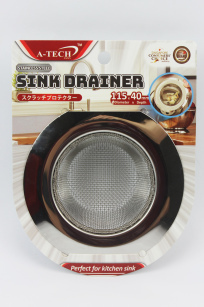 The evenly distributed holes allow water to flow through the drainer yet traps food debris and prevents clogging. 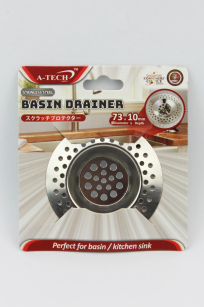 BASIN STEEL DRAINER (73mm) is made of quality Stainless Steel, it has a unique sloped edges to allow water to be effectively channeled into the drain. The evenly distributed holes on the slopes also serves to increase water flow into the drain while trapping food debris and prevents clogging. 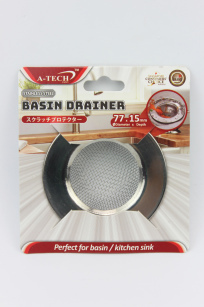 STEEL SINK DRAINER (S) – 77 x 15mm is made of quality composite Steel, it has a flat sloped ring around the drainer to effectively channel water flow into the drainer. 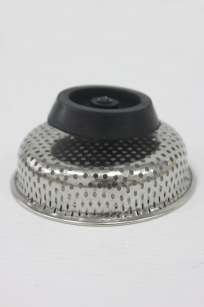 It also has meshed design that not only traps debris with its smaller holes yet it also has lesser water resistance hence, significantly reduces the chances of clogging. 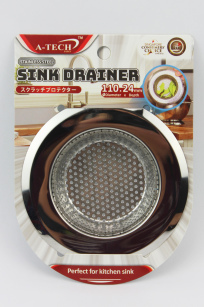 S/STEEL SINK DRAINER (110 x 20mm) is made of stainless steel material making it resistant to rust and corrosion. 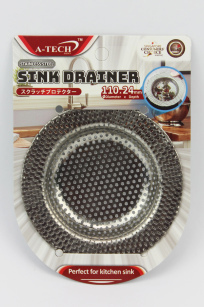 It has small holes that allows water to flow but not food debris, hence reducing the the likelyhood of a clogged kitchen sink. 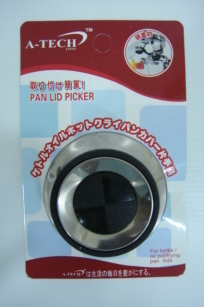 It comes with a handle that allows the drainer to be easily lifted out of the sink for cleaning purposes. Most suitable for kitchen sinks. 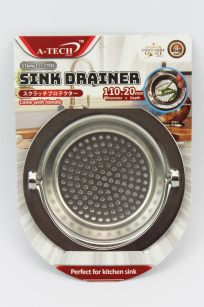 S/STEEL SINK DRAINER W/STOPPER – 83 x 22mm is made of Top quality stainless Steel, it has rubber stopper built-directly onto the drainer itself to plug and stop water drain, It also has evenly distributed holes that not only traps debris with its smaller holes yet it also reduces the chances of clogging. 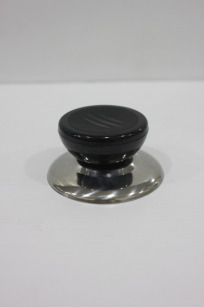 SINK WASTE (40MM) comes as a complete set with a sink drainer cover that is made of top grade stainless steel, with a rubber seal at the bottom to effectively stop the water drain when the cover is pushed down. 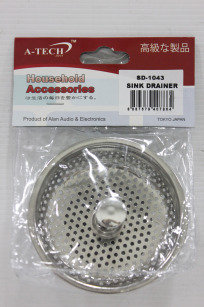 SINK DRAINER COVER is designed to fit 40mm Sink waste fittings. 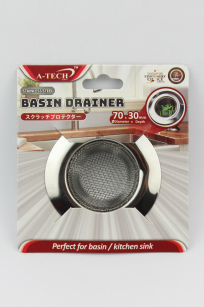 It is made of top grade stainless steel, with a rubber seal at the bottom to effectively stop the water drain when the cover is pushed down. 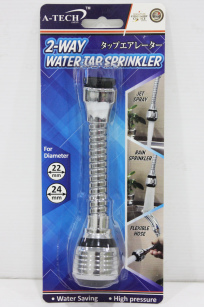 2 WAY FLEXI TAP SPRINKLER is also commonly called water tap aerator, the product includes a conversion head that fits on tap 22mm & 24mm. 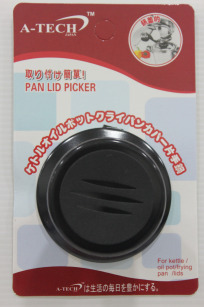 It comes with a built in flexible head that is able to rotate 360 degrees for optimum reach. 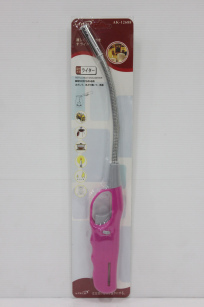 It has 2 spray Functions, Jet Spray / Rain Sprinkler. 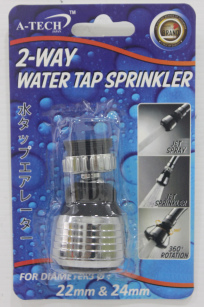 2 WAY TAP SPRINKLER is also commonly called water tap aerator, the product includes a conversion head that fits on tap 22mm & 24mm. 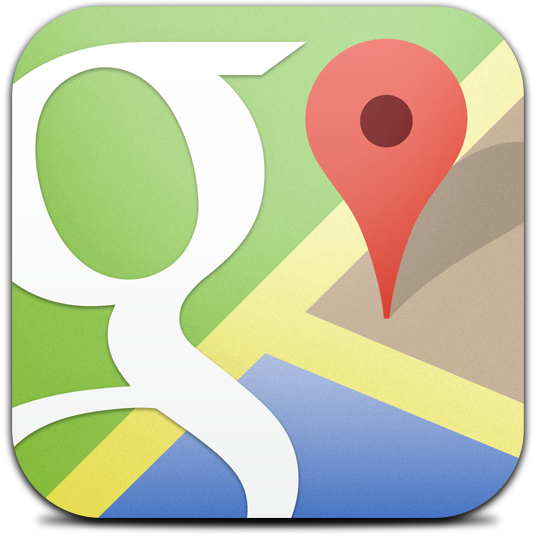 It is able to rotate 360 degrees for optimum reach. It has 2 spray Functions, Jet Spray Rain. *Sells in a card of 12 pieces ONLY! 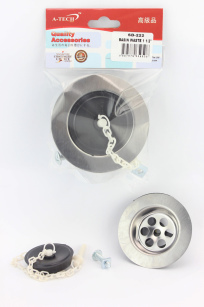 WATER TAP FILTER- (12PCS/CARD) is able to effectively remove dirt and filter water coming from the tap, it also controls the water flow and prevents water from splashing and wetting the kitchen basin. 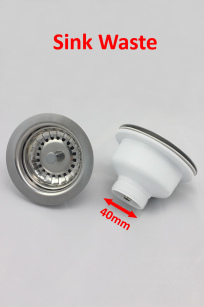 It easy to install onto common kitchen mixers and faucets. *Sells in a big packet of 12 packets Only. 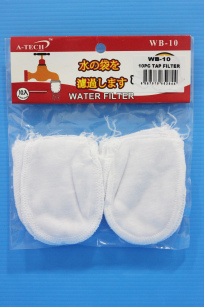 TAP FILTER – 10PIECE (12PACKETS/PACK) is commonly attached onto water taps, it effectively filters out impurities from the water. It is extremely easy to use and is very widely used method of water purification in most households. PVC BAG CARRIER is a simple tool to allow the user to carry shopping / grocery bags comfortably. Conventional shopping bags then to put strain & cause discomfort especially when the bags are full & heavy. 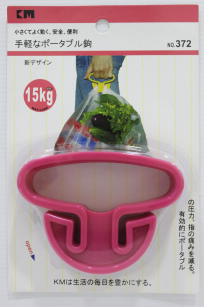 The product solves this problem by effectively distributing the weight of the bags lessen the stain on the hands allowing the user`s to have better grip. 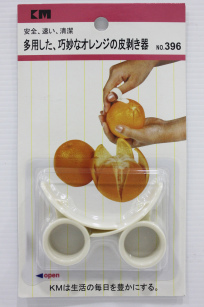 ORANGE PEELER is designed to conveniently peel off the orange skin without leaving a mess. 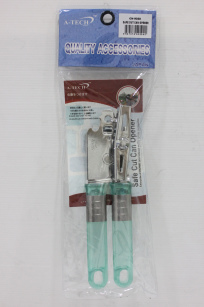 easy to use and does not have sharp edges which may cause injury. 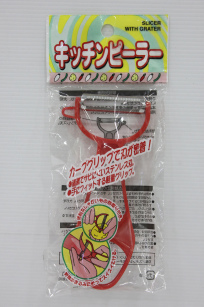 Most suitable for children use. 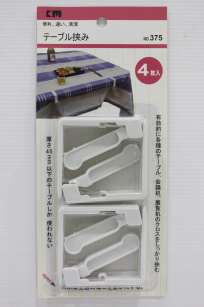 TABLE TOP CLIP (4PC) is the most effective solution to tightly secure your table cloths to prevent them from being blown away by wind. 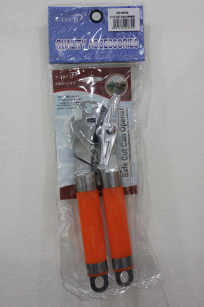 Most suitable for use for Outdoor BBQs or picnics. The clip can be used on various types of table due to its unique clip function. 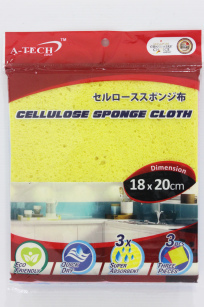 CELLULOSE SPONGE CLOTH (3PCS) – 18cm x 20cm is made of Eco-friendly natural plant fiber. 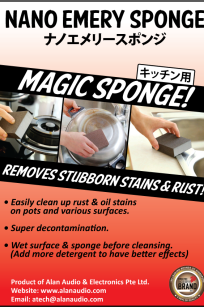 It is suitable for all types of cleaning purposes and is super absorbent (Up to 3 times of product weight). It is washable and reusable and dries quickly and easily. 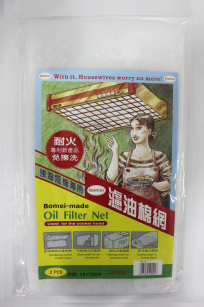 If can be used for cleaning kitchen tops, bathroom sanitary ware, kitchen and cooking ware and many more. Comes in a pack of 3 piece with assorted colours. 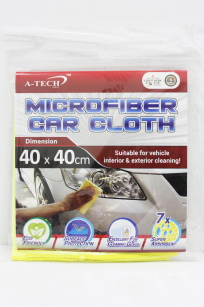 MICROFIBRE CAR CLOTH – 40cm x 40cm is made of an eco-friendly microfiber material. 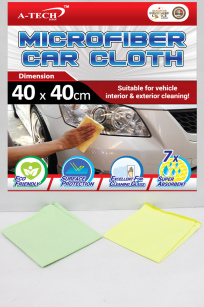 The cloth is perfect for cleaning both vehicle interior & exterior cleaning. 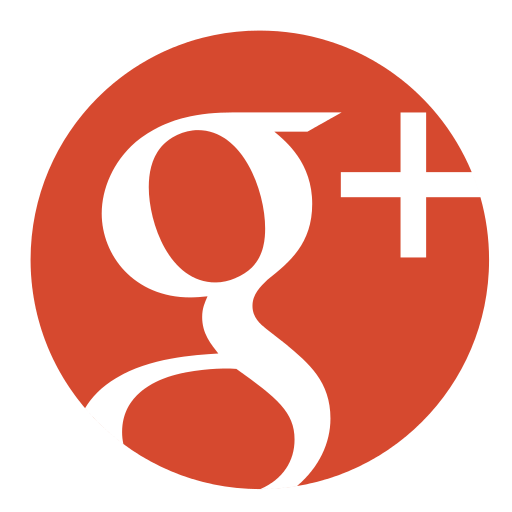 It is also great for glossy surfaces like glass and car body as the cloth is designed for surface protection. The cloth is ultra absorbent (up to 7 times of product weight). 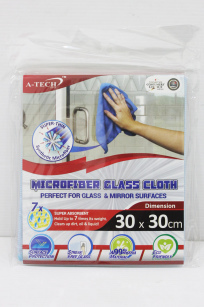 MICROFIBRE GLASS CLOTH – 30cm x 30cm is made of an eco-friendly microfiber material. 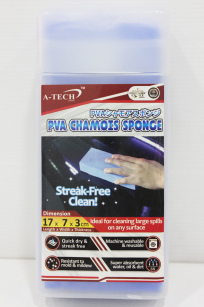 It specifically designed for cleaning glass surfaces with surface protection and anti-bacteria properties. 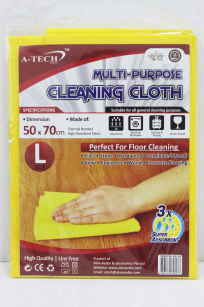 The cloth is ultra absorbent (up to 7 times of product weight) and can effectively clean up dirt, oil & liquid easily. 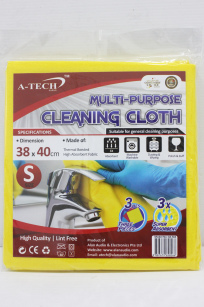 MULTI PURPOSE CLEANING CLOTH (3PCS) – 38 x 40cm is made of Thermal Bonded High Absorbent Fabric. 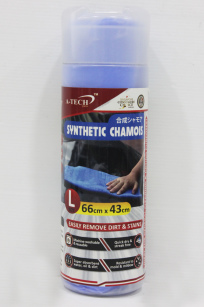 The cloth is perfect for various types of cleaning applications like Dusting, wiping, polishing or buffing. It is capable of absorbing liquid 3x of its product weight. Comes in two sizes Small & Large to suit consumer`s requirements and needs. 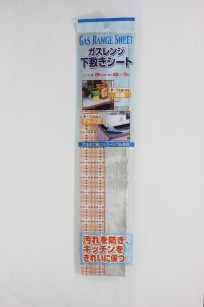 MULTI PURPOSE CLEANING CLOTH (LARGE) – 50 x 70cm is made of Thermal Bonded High Absorbent Fabric. The cloth is perfect for various types of cleaning applications like Dusting, wiping, polishing or buffing and also floor cleaning. It is capable of absorbing liquid 3x of its product weight. 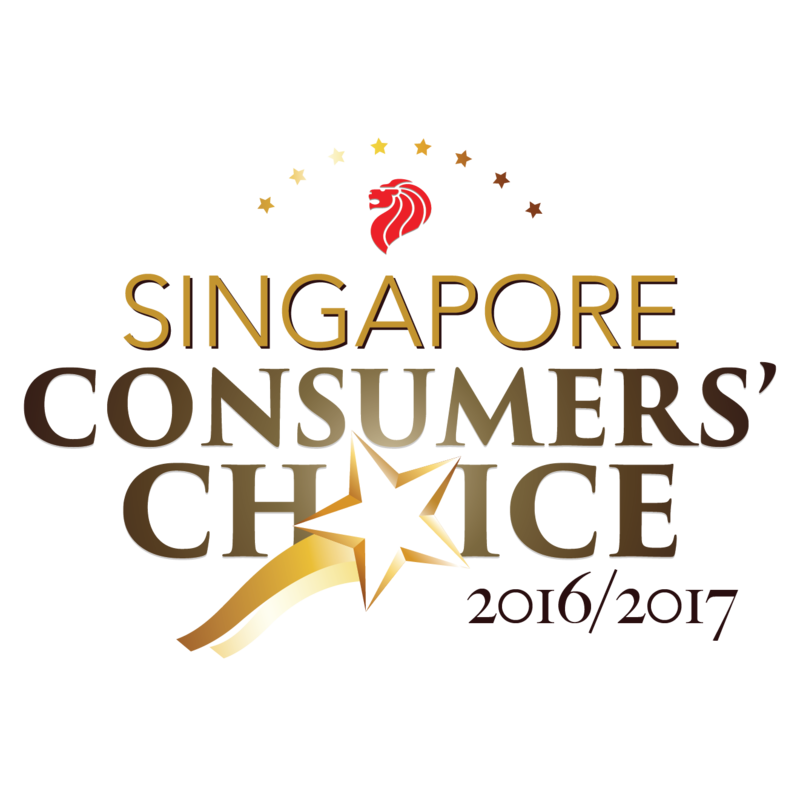 Comes in two sizes Small & Large to suit consumer`s requirements and needs. 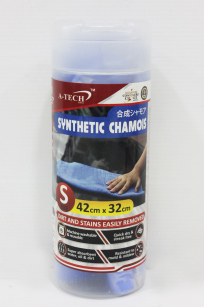 SYNTHETIC CHAMOIS CLOTH (SMALL) – 42cm x 32cm is an ultra water absorbent cloth made of special synthetic chamois that allows the cloth to easily remove dirt & stains. 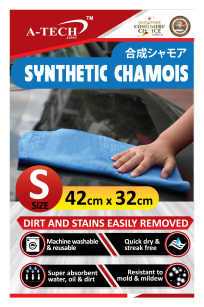 It is ideal for wide variety of cleaning and drying application such as car cleaning, general cleaning, use as sports & bath towel. 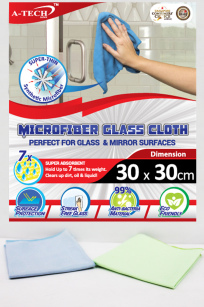 It is Resistant to mold and mildew and is machine washable & reusable. Comes in Small & Large size suit consumer`s needs. 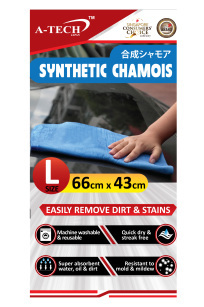 SYNTHETIC CHAMOIS CLOTH (LARGE) – 66cm x 43cm is an ultra water absorbent cloth made of special synthetic chamois that allows the cloth to easily remove dirt & stains. 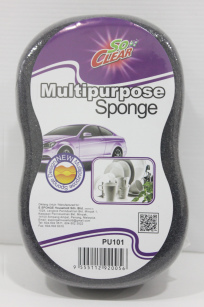 It is ideal for wide variety of cleaning and drying application such as car cleaning, general cleaning, use as sports & bath towel. 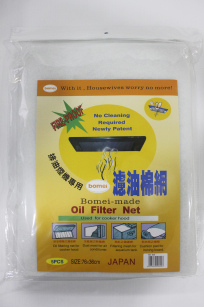 It is Resistant to mold and mildew and is machine washable & reusable. Comes in Small & Large size suit consumer`s needs. 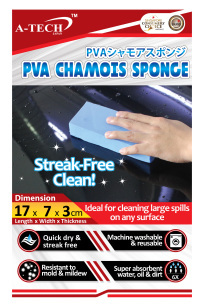 PVA CHAMOIS SPONGE -17cm x 7cm x 3cm is an ultra water absorbent sponge made of special synthetic chamois that allows the sponge to easily remove dirt & stains. 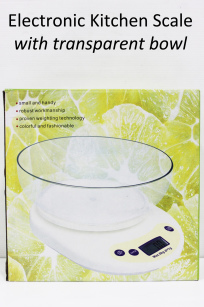 It is capable of absorbing up to 6 times its product weight of water. making it ideal for cleaning & drying applications such as car interior & exteriors, kitchen top & stoves, Furniture & Fittings, Bathroom & sanitary wares and many more. 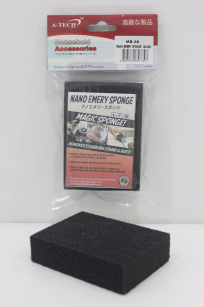 NANO EMERY SPONGE (BLACK) is also known as Magic Sponge, is a unique type of sponge that utilizes nano-technology to remove stubborn stains such as charred stains and rusts that is commonly found on your cooking ware. 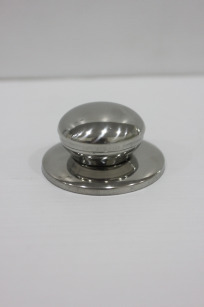 The stains are often difficult to remove even with metal scrubs and dish washing liquids but with the use of the product the stains can easily be removed with just water. 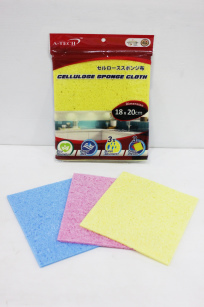 MULTI-PURPOSE SPONGE- 16cm(L) x 10cm(W) x 5cm(D) is made for various applications such as dish washing, car wash, floor cleaning and many more. It has high foam density and concave surface for cleaning uneven surfaces. GENERAL PURPOSE GLOVE – SMALL (S SIZE) is made from a specially formulated rubber compound for increased durability and lasting use. 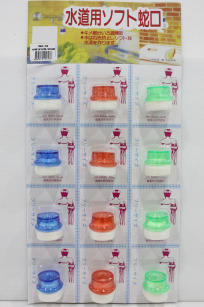 They are chemically treated for easy donning and better grip. 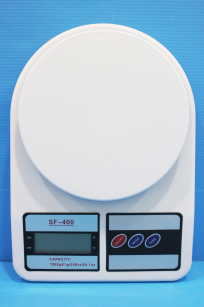 They are dust free for food contact use and tested food safe under the CE Directive. 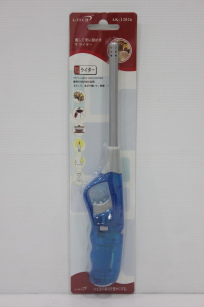 suitable for various applications such as General Domestic use, Janitorial, Food preparation. Available in three sizes to fit different hand sizes. GENERAL PURPOSE GLOVE – MEDIUM (M SIZE) is made from a specially formulated rubber compound for increased durability and lasting use. 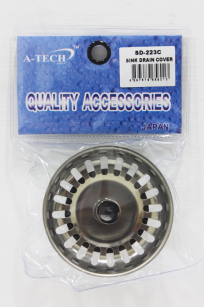 They are chemically treated for easy donning and better grip. They are dust free for food contact use and tested food safe under the CE Directive. 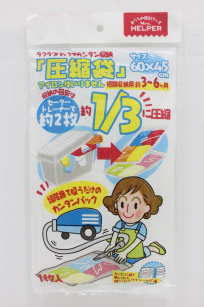 suitable for various applications such as General Domestic use, Janitorial, Food preparation. Available in three sizes to fit different hand sizes. 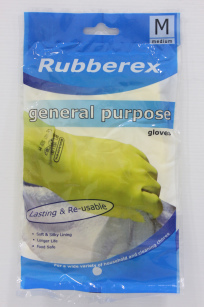 GENERAL PURPOSE GLOVE – LARGE (L SIZE) is made from a specially formulated rubber compound for increased durability and lasting use. 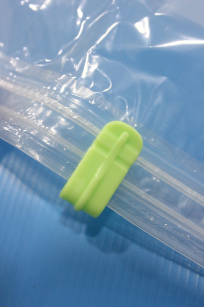 They are chemically treated for easy donning and better grip. They are dust free for food contact use and tested food safe under the CE Directive. 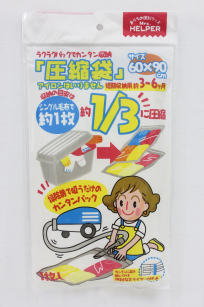 suitable for various applications such as General Domestic use, Janitorial, Food preparation. Available in three sizes to fit different hand sizes. 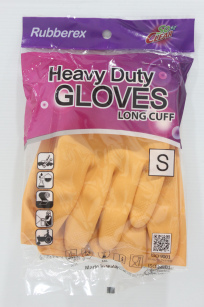 HEAVY DUTY GLOVE – SMALL (S SIZE) is made from a special synthetic compound that is tough and is not easily cut by knives or sharp objects, it also provides excellent resistance against chemicals. The gloves makes use of Electro Static Lining to keep your hands cool and comfortable while effectively protecting your hands from external hazards. 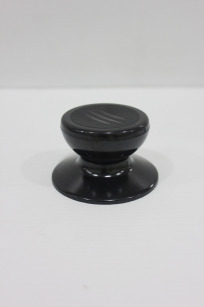 The product is made from top grade rubber from malaysia and is designed for both industrial as well as household usage. Available in three sizes to suit different hand size. 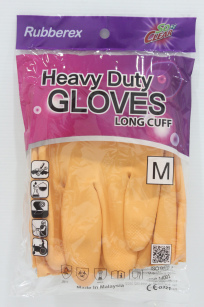 HEAVY DUTY GLOVE – MEDIUM (M SIZE) is made from a special synthetic compound that is tough and is not easily cut by knives or sharp objects, it also provides excellent resistance against chemicals. The gloves makes use of Electro Static Lining to keep your hands cool and comfortable while effectively protecting your hands from external hazards. 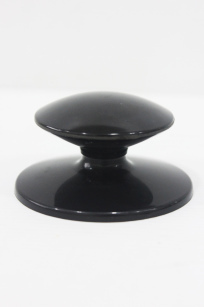 The product is made from top grade rubber from malaysia and is designed for both industrial as well as household usage. Available in three sizes to suit different hand size. 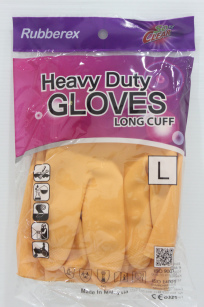 HEAVY DUTY GLOVE – LARGE (L SIZE) is made from a special synthetic compound that is tough and is not easily cut by knives or sharp objects, it also provides excellent resistance against chemicals. The gloves makes use of Electro Static Lining to keep your hands cool and comfortable while effectively protecting your hands from external hazards. 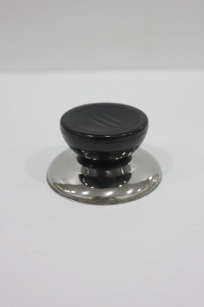 The product is made from top grade rubber from malaysia and is designed for both industrial as well as household usage. Available in three sizes to suit different hand size. 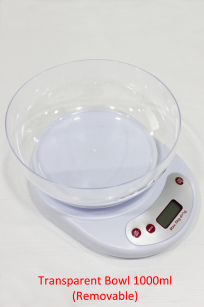 Put the bowl onto the scale and press “Zero” button to void the weight of the bowl for accurate measurement of the contents. VACUUM BAG WITH CLIP (60CM x 45CM) is also known as ziplock bags with clip, it is an innovative way of storing clothing such as Winter wears, old clothings, bedsheets and more. Simply fold the clothes into the bag and seal with the clip. with the help of a vacuum cleaner, the bag can be compress tightly and quickly saving the hassle of trying to squeeze the air out manually. VACUUM BAG WITH CLIP (60CM x 60CM) is also known as ziplock bags with clip, it is an innovative way of storing clothing such as Winter wears, old clothings, bedsheets and more. Simply fold the clothes into the bag and seal with the clip. with the help of a vacuum cleaner, the bag can be compress tightly and quickly saving the hassle of trying to squeeze the air out manually. 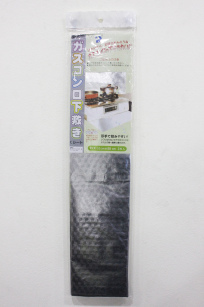 VACUUM BAG WITH CLIP (60CM x 90CM) is also known as ziplock bags with clip, it is an innovative way of storing clothing such as Winter wears, old clothings, bedsheets and more. Simply fold the clothes into the bag and seal with the clip. with the help of a vacuum cleaner, the bag can be compress tightly and quickly saving the hassle of trying to squeeze the air out manually. 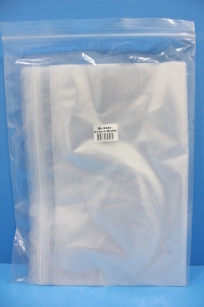 ZIPLOCK BAG – 33 X 43CM (6PCS/PK) is made of thick quality plastic that does not easily break when in use. It can be air-tight sealed by the use of the ziplock, commonly use to store food stuff / medication / jewellery / clothings & many more. Available in a wide range of sizes to suit consumer`s requirement.